The Spindrift Townhouses are two-storey beachfront accommodation with private access to spectacular Four Mile Beach. 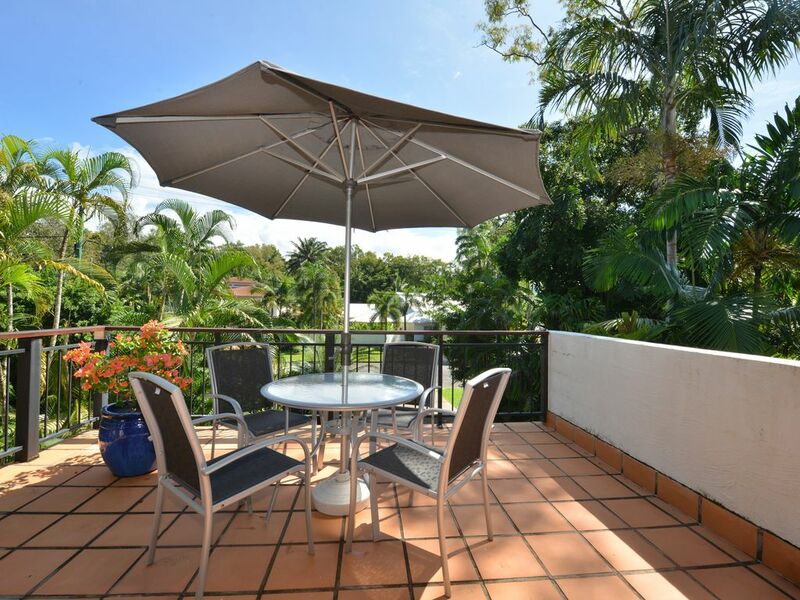 A row of three townhouses, they offer the best of Port Douglas living with a tropical rainforest setting and absolute beach frontage. Delightful landscaping at the front of the property surrounds the shared swimming pool. The pool has been positioned to capture the sun all day. Entry into Townhouse No.1 is via undercover parking and through to a large living and dining area. Light and airy with high ceilings and sky lights, the living space has Palmer River slate floors and a fully equipped Kwila timber kitchen with modern appliances. Large glass sliding doors open to a private courtyard with outside dining and barbeque facilities. The courtyard overlooks a garden which is reminiscent of Cape Tribulation, with a giant Strangler fig that towers over the property. This is one of the few remaining patches of pristine rainforest left on the beachfront. The ground floor also has a laundry and bathroom, very practical for beach and pool side living. Upstairs, the two bedrooms each have verandas, a bathroom and delightful individual aspects. One room overlooks the rainforest garden; the sounds of the ocean are clearly audible, see the bird life flitting about the ferns, flowers and towering trees. The second bedroom veranda provides the perfect suntrap and great visual access to the swimming pool. The townhouse has full insect screening and air-conditioning with a TV, Foxtel and DVD. Dedicated owners are committed to providing luxury holiday accommodation. Strategically placed on a large allotment, the townhouse affords tranquillity with private beach access in the peaceful Solander area. Awesome place. So close to the beach. Very comfortable. Everything you need is there. Well set out. Clean, well equiped, well managed. Thank you for your glowing review, Anne. We are so pleased you enjoyed your time at Spindrift and the unique location, under the rainforest canopy and so close to the beach. We would love to welcome you back again! The rain forest walk to the breach is the clincher, so unspoiled and stunning. We liked being a bit out of the main craziness of school holidays Port Douglas in the lovely Solander area and hiring bikes for a week was great fun and allowed us to get around easily and keep fit. A very relaxed, airy, well equipped and comfy property, we will be back! We loved staying at Spindrift No 3 - a great townhouse tucked in behind the rainforest - quiet, comfortable and perfect for a family of 4. Loved the short walk through the rainforest on to Four Mile Beach - quieter end of the beach and a great 20 minute walk into the Port.